TCAS, the Traffic Alert and Collision Avoidance System, has helped keep commercial and military aviation safe since 1990. The safety of commercial aircraft in the United States is something most travelers take for granted. It's been 23 years since the last aircraft collision over the U.S., thanks to a network of complementary systems that augment pilots' situational awareness of the airspace surrounding them. But as these systems age and new technologies come to the fore, MITRE is building on advances from our 50 years of research in air traffic management and 35 years of research into collision avoidance technologies to help them function even more effectively. One of the most important safety tools in the pilot's arsenal is the Traffic Alert and Collision Avoidance System, or TCAS. Now the world standard collision avoidance system for commercial aircraft, TCAS, originally developed in the mid-1970s by MITRE and a host of other organizations, including the Federal Aviation Administration (FAA) Technical Center and MIT Lincoln Laboratory, works independently from ground air traffic control systems. It uses range, bearing, and altitude data from aircraft radar transponders to predict when aircraft threaten to approach too closely to one another and prompts pilots to make evasive maneuvers. 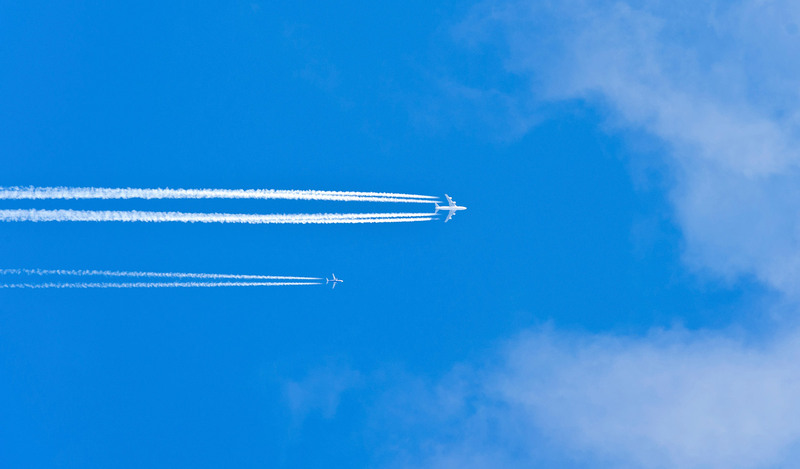 Prior to the advent of TCAS, the airline industry struggled with the challenge of how to add collision avoidance capabilities to existing air traffic control procedures, explains Andy Zeitlin, a senior principal simulation modeling engineer at MITRE. With no such capabilities in place, traveling by air was a much more hazardous proposition than it is today. TCAS was one of many air traffic management system enhancements that helped make air travel safer over time. MITRE's groundbreaking contribution to TCAS' development involved using planes' existing air traffic control radar transponders for an aircraft-based collision avoidance capability. The TCAS prototype was developed at MITRE, and our engineers have worked with the FAA, commercial companies, academic institutions, other federally funded research and development centers, and international organizations to further refine the system ever since. TCAS functions as "electronic eyes" for pilots, providing them with an enhanced view of nearby flight traffic. It consists of hardware and software integrated with other systems in the cockpit and includes a display showing the relative positions and altitudes of aircraft up to 40 miles away. When aircraft come within a certain range of each other, TCAS sounds an alarm and issues conflict advisory and resolution instructions, acting as a backup to the ground air traffic control system's separation processes. The original TCAS prototype took many years to develop, as our engineers created algorithms to detect collision threats and advise pilots. "MITRE concentrated on developing the collision avoidance logic," says Zeitlin. "As we continued working on this, industry stepped up the development of updated transponder equipment." The FAA, the major commercial airlines, MIT Lincoln Laboratory, and other companies all had a hand in TCAS' ongoing development. MITRE engineers have had a major role in the development of two key aviation safety technologies: TCAS and ADS-B. Both systems were developed in response to deadly midair disasters. "People point to the infamous 1956 Grand Canyon collision as the original impetus for the development of airborne collision avoidance solutions," says MITRE's Andy Zeitlin, who has been involved with TCAS development since the mid-1970s. The 1956 incident, in which two commercial planes collided over the Grand Canyon, killed more than 100 people and followed many similar crashes between 1950 and 1955. "The solutions proposed in the late 1950s and early 1960s would have required planes to carry special equipment, which would have been prohibitively expensive and time-consuming to develop at that time," Zeitlin explains. Since being developed in the early 1990s, ADS-B has been further refined by MITRE and several government and industry partners. It uses Global Positioning System technology to determine a plane's exact location and whether it's climbing, descending, or turning, broadcasting this data in real time. Armed with this information, pilots can maintain situational awareness of other aircraft around them, allowing for safer and more efficient flights. Beginning in 2001, ADS-B has also been used by air traffic controllers to provide separation services to equipped aircraft. MITRE's research has pursued the best way for these systems to complement each other, and as a result they are beginning to be used together today. Through the integrated system, TCAS provides collision avoidance and ADS-B improves situational awareness by giving pilots a better view of traffic, as well as supporting spacing operations. To make use of the improved information offered by ADS-B, MITRE aims to improve the collision avoidance functions' awareness of flight maneuvers enabled by ADS-B to achieve new operational efficiencies while improving collision avoidance capabilities. MITRE's Beacon-Based Collision Avoidance System, or BCAS, preceded today's TCAS. This version of the system sent out interrogation signals to nearby aircraft, and aircraft transponders sent back replies. The system interpreted the signals to determine the location, speed, and course of each aircraft, as today's TCAS does. In 1986, the FAA elected to pursue further development of BCAS' onboard design rather than a ground-based system also under consideration at the time, and BCAS was renamed TCAS. One version of the system, known as TCAS I (used mainly by small commuter, mostly turboprop aircraft), indicates the bearing and relative altitude of all aircraft within a selected range. This version includes a "Traffic Advisory" feature. When pilots receive a traffic advisory, they have the option of altering the plane's altitude. TCAS I provides data enabling pilots to determine the best solutions. The more comprehensive TCAS II, used on all larger aircraft, also provides pilots with "Resolution Advisories," which offer detailed instructions on how to execute evasive maneuvers, and these maneuvers are coordinated if both aircraft are TCAS-equipped. As a centerpiece of our work on refining TCAS II, MITRE performed Monte Carlo computer simulations that generated numerous variations of collision scenarios, enabling the system logic to be tested thoroughly. This data, along with other test simulations designed to assess TCAS' effectiveness and compatibility with aircraft operations, bolstered the case for a Congressional mandate of TCAS' use on commercial aircraft. That mandate followed a fatal mid-air collision of two aircraft over Cerritos, California in 1986. The first TCAS were installed on commercial aircraft in 1990, and implementation on all U.S. commercial aircraft was completed by 1993, under the Congressional mandate. "Our Algorithms Are in Every Airplane"
In spite of some growing pains in the early stages of its development—when the system sometimes issued unnecessary alarms—TCAS has continued to perform successfully through several upgrades over the years. "Today our algorithms are in every airplane," Zeitlin notes. "Once we got the technology out there, we got a better idea of how pilots wanted to use it." In 1997, MITRE engineers completed what they thought would be the final version of TCAS, according to Zeitlin. By the following year, the International Civil Aviation Organization (ICAO) made the system an international standard and required its installation on all commercial aircraft. That same year, the FAA retired its TCAS program office. But the system's ongoing installation in aircraft in Europe subsequently uncovered new safety issues, so upgrade work began once again, and with MITRE's help, version 7.1 of the TCAS logic was completed in 2008. Zeitlin and other MITRE experts continue to work closely with international and domestic standards-making bodies such as ICAO and RTCA, Inc., an advisory board charged with developing consensus-based recommendations on air traffic management system issues for the FAA. MITRE engineers are focused on helping the FAA advance its work on the Next Generation Air Transportation System (NextGen) by examining how TCAS technologies should develop as the Performance Based Navigation (PBN) procedures and ADS-B applications required by NextGen become operational. While today's national airspace system relies on a fixed structure tied to thousands of ground-based navigational aids, NextGen will enable pilots to assume some tasks now handled by air traffic controllers, thanks to new cockpit tools providing better information to pilots. The NextGen system will ensure that military and civil aviation can operate seamlessly in both national and international airspace. Based on net-centric operations, NextGen will use an enterprise-wide network for quickly sharing air transportation system information to substantially improve situational awareness and shorten decision cycles. "NextGen will change the fundamental ways that air traffic is managed," Zeitlin says. "The challenge for TCAS is for it to continue to add safety to the system and not interfere with how the pilots and the controllers work. It will require collision avoidance to use new information elements." As a result, many aspects of the existing TCAS design will need to be updated as NextGen development advances, he explains. Roxaneh Chamlou, a principal multi-discipline systems engineer at MITRE, began the work to analyze the role of future TCAS technologies in the overall NextGen collision avoidance architecture. Chamlou’s work established the performance baseline for TCAS in today's environment using new metrics for assessment of detection and avoidance algorithms. By 2020, new detection and avoidance algorithms, based on ADS-B information, will be developed for a NextGen collision avoidance system. MITRE researchers also recently completed an analysis of proposed airborne surveillance applications that may not be compatible with the current TCAS design. Ongoing research includes the development of performance metrics for upgraded collision avoidance concepts and prototypes.